A bit of Chelsea made its way to Tennessee this summer when, as a result of the ‘Nashville calling: Hatch Show Print’ exhibition at Chelsea Space last year, Nigel Bents, senior lecturer on Chelsea’s BA Graphic Design Communication, visited the city to meet up with Hatch Show Print Director Jim Sherraden and the collector and curator Jason Brown. The reverse of the postcards when put together, showing work from BA Design Communication students that was sent to Nashville, Tenessee this summer. 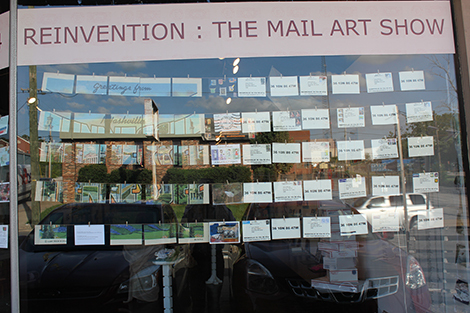 To coincide with his visit, Jason Brown opened a very large show of Mail Art at Nashville’s The Green Gallery, which included a significant contribution of work by Nigel’s Chelsea students. 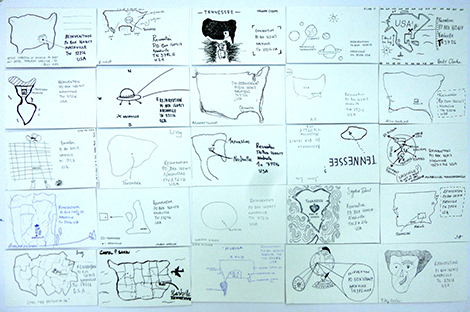 For their submissions to the exhibition, each student was asked to draw a map identifying Nashville, Tennessee – the destination of their work of art. These images were drawn on the back of a card that Nigel had produced by enlarging a vintage postcard and dividing it up into a jigsaw-like grid. All of the resulting works were then sent to Nashville to be displayed in the show. Chelsea students’ work on show in the window of The Green Gallery, Nasville. 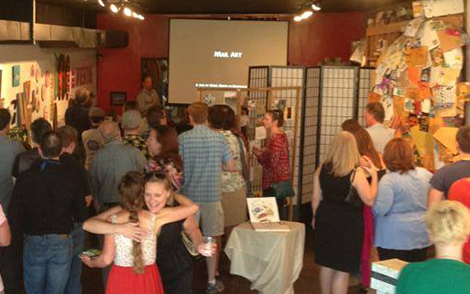 Nigel’s lecture at the Mail Art exhibition, Nashville. 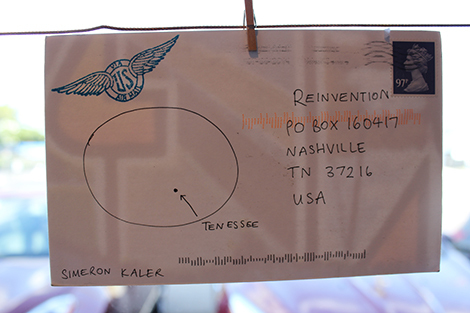 The exhibition was covered extensively in the local press, and you can read an article about the show in The Tennessean, online on their website and find out more about the project on the Nashville Mail Art blog. Find out more about Hatch Show Print’s exhibition Nashville Calling at Chelsea Space last year on the gallery’s website. 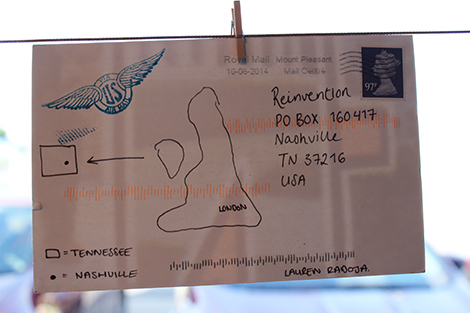 Find out more about Ray Johnson’s work with mail art on his website. Find out more about studying BA Graphic Design Communication at Chelsea, vist our course pages.